So, How did it end? Did it end? The account is free, yes. 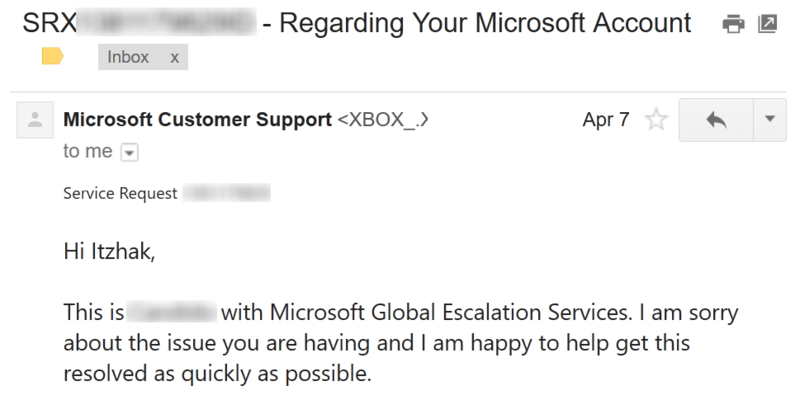 With the help of C’, a Microsoft Global Escalation Services representative – we were able to recover the account. 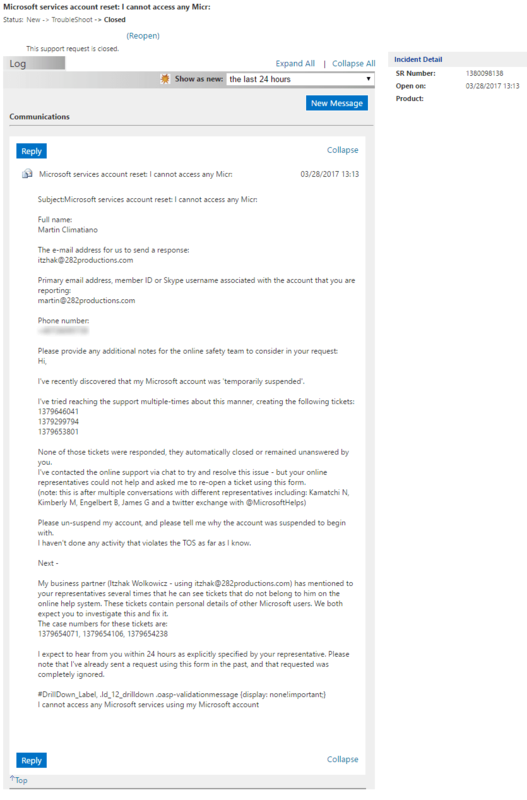 Microsoft requested details not only about the mentioned Microsoft account but about the Bizspark program associated with it, and after we supplied the full details, they have removed the account suspension. 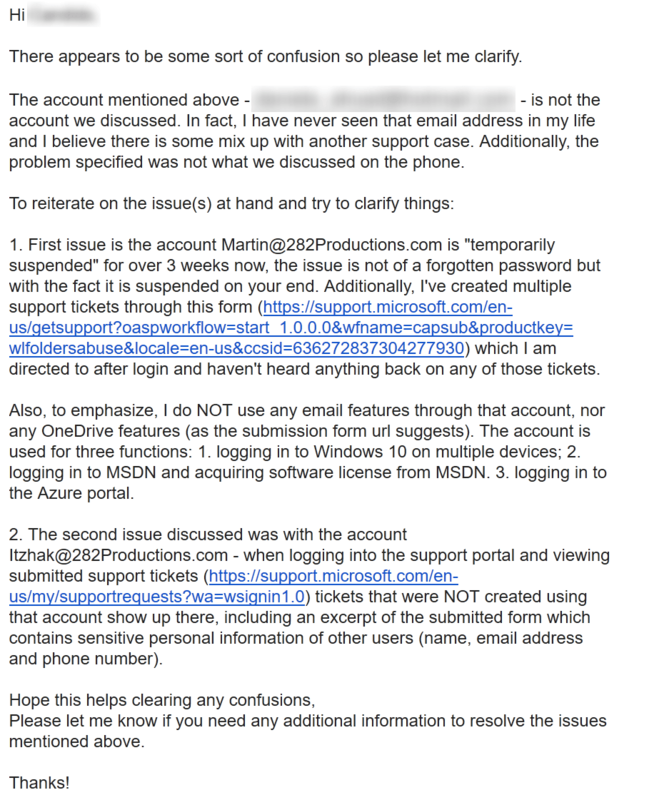 We haven’t managed to understand why the account was suspended in the first place, nor did we managed to get MS to take a look at their ticketing system (which still shows tickets of other MS users). Investing a month in trying to get answers is more than enough. Let’s hope our tickets are not available to other MS users… let’s hope yours isn’t, as well. Why would it work? does anything automated at Microsoft works? Tzahi got a call today from Microsoft’s rep who apologized for the mix up with the support issues. To be honest, I can’t blame him – when every single automated system is broken I can only assume their CS reps are drowning in work. I truly do not envy him. 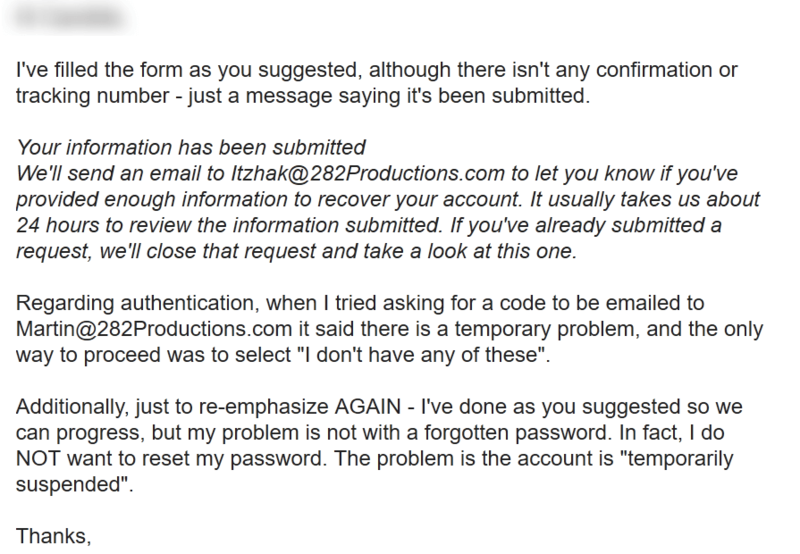 After the call he sends an email with instructions on how to submit a password reset form – again, not the issue I reported, but I decide to play along in hopes that it somehow helps resolving the issue. 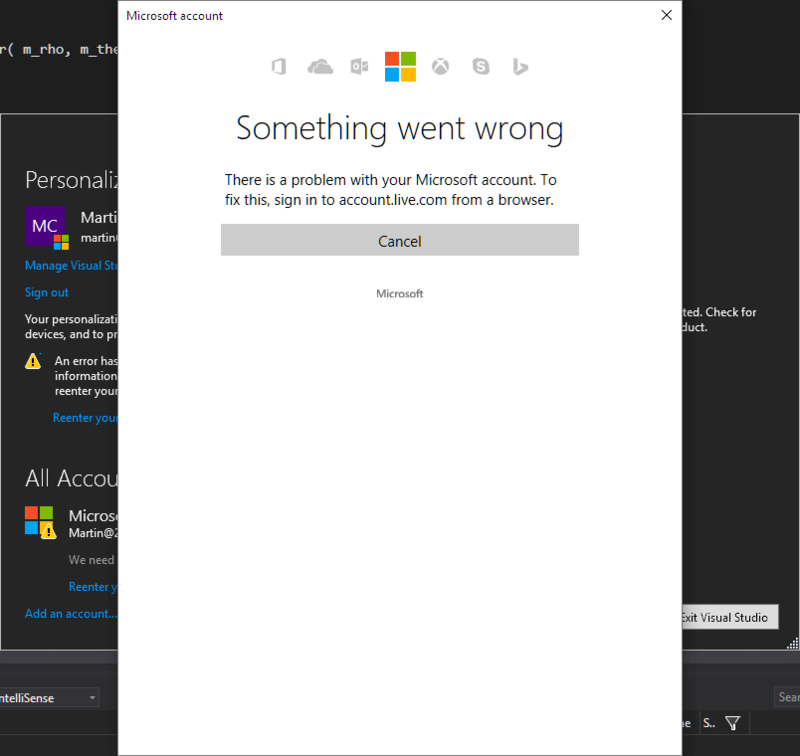 The way things are going so far, I’m starting to believe that by the end of it I’ll have a new password for my account, 500gb of storage on outlook and a date with Cortana – but still won’t be able to log in to MSDN because the account is suspended. 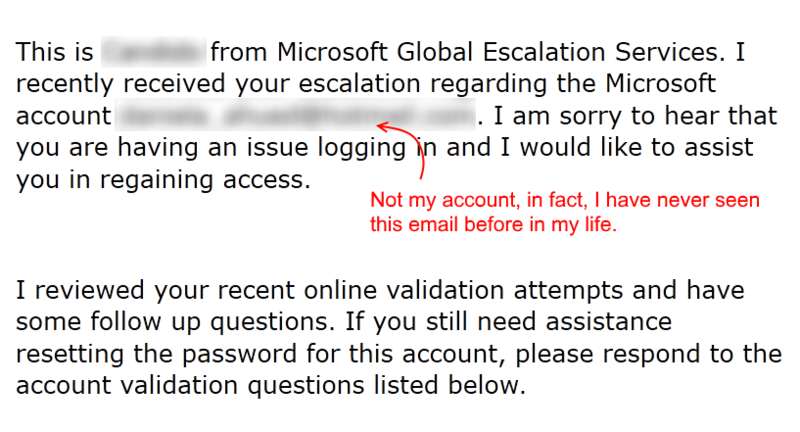 I couldn’t stop laughing when I got this email from the guy at Microsoft Global Escalation team. I then called Tzahi at 10 past midnight just to laugh with him on the phone for another half an hour. This whole story reaches new levels of absurd on a daily basis. At this point I’m not sure if this is real or just a really elaborate prank. It only took 3 weeks, but I managed to talk to someone at Microsoft who actually has access to their support ticket system. Let’s hope this saga is nearing an end. So apparently, if you want to get Microsoft Support attention on Twitter you need to be rude, obnoxious and use a HUGE FONT with RED BACKGROUND. So once again, a promise that the support team will communicate. 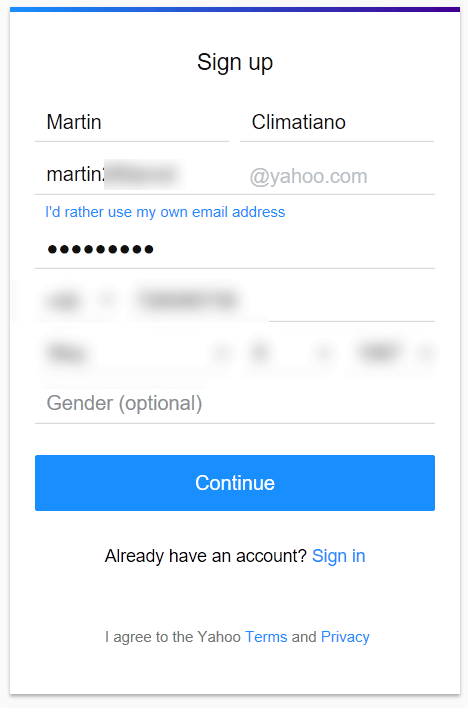 It’s been over 24 hours since submitting my last support ticket and using a Yahoo email account for correspondence. Want to guess what communication I go from Microsoft? Yes, none. Even the spam folder is empty. My account is still suspended. I have gotten zero communication from Microsoft – so far nothing is new. 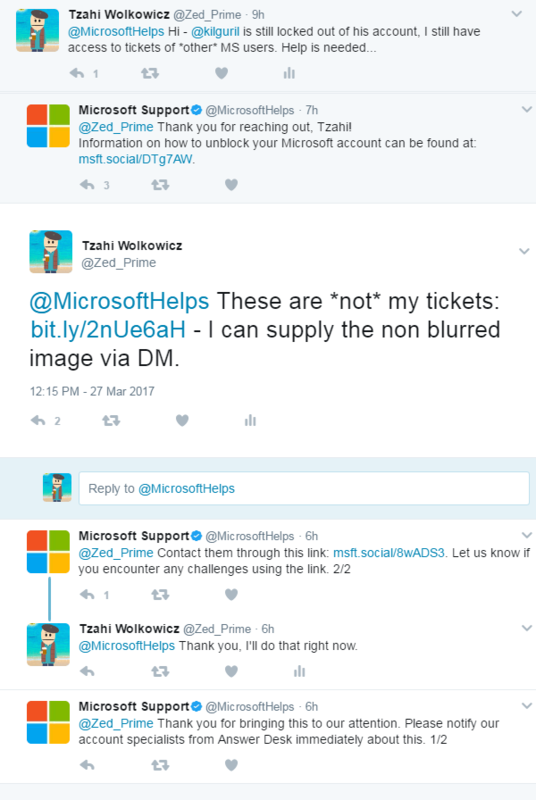 Another thing that is not new is the fact Tzahi can still see personal information of other Microsoft users through the support ticketing system. Maybe it’s time to email them and point out the fact their personal information is leaking from the support system – you know, the thing both me and Tzahi tried communicating to Microsoft for almost a week now through multiple messages and support tickets. Just for the sake of argument, I agree to open a new email account and try submitting a support ticket again. Here we go AGAIN – lost track of how many of these tickets I’ve submitted already. Will the next call fare better? The second person I talked to tried to convince me that the only way to resolve the unresponsiveness from Microsoft would be to send yet an additional ticket, but from a NEWLY created email address. 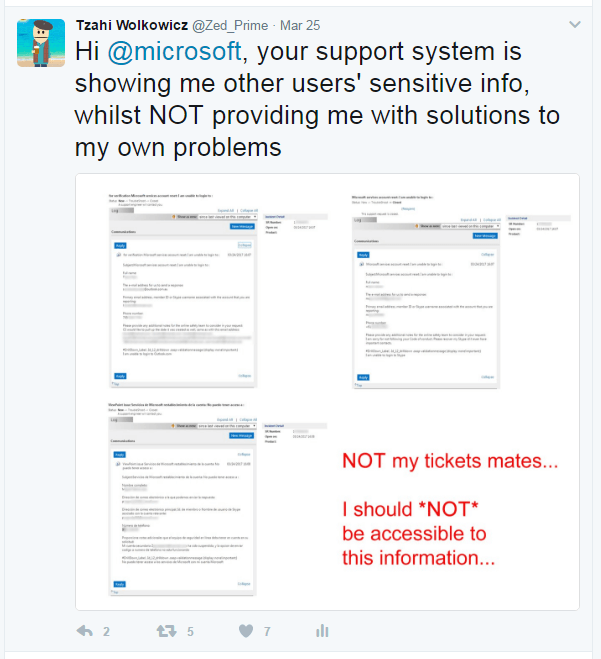 Also, just to reemphasize on that conversation – Microsoft support representatives do not have access to support tickets… what?! Only to have the call drop. Our 2nd try went even faster. some sort of a feed-back loop prevented the automated system to guide us to the right department. Our first try at calling MS corporate office – was not successful. apperantly, you should not choose the windows option if you wish the call to continue. With no actual help by MS support, me and Tzahi have started sharing the website in social networks. The website was shared on Twitter, Reddit and Hacker News. Funny thing is I wasn’t even the one to open the discussion on Reddit. 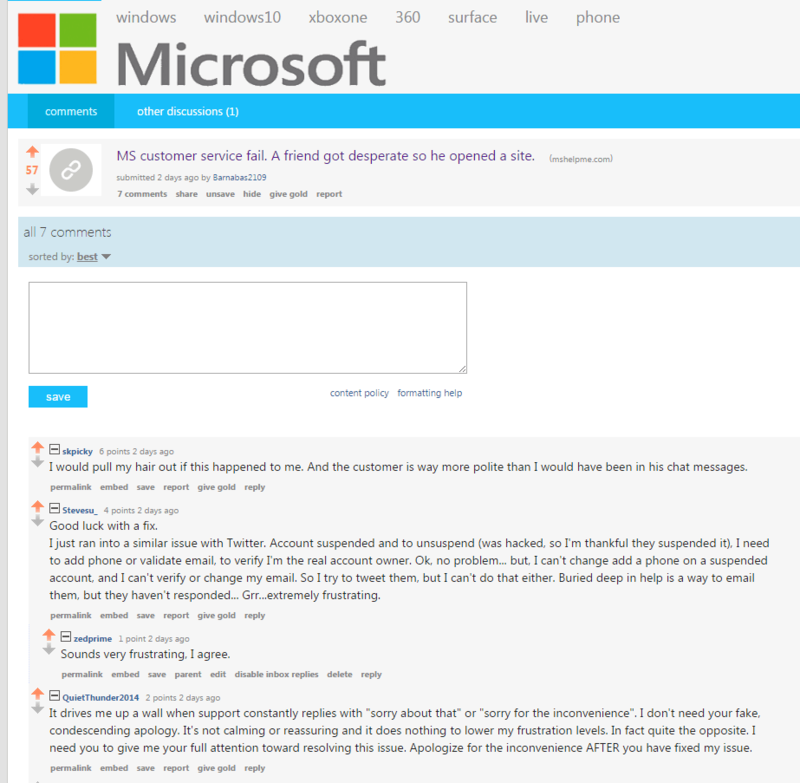 This discussion was the highest upvoted on the r/microsoft subreddit – wonder why. Too bad it was removed shortly after – guess on r/microsoft it’s only ok to praise Microsoft and not point out things that need URGENT improvement. I cannot say it was a COMPLETE waste of 0.20€ in Skype credit. At least I now have a new lead to solving the curious case of the unresolved support tickets. Another day, another closed support ticket without any communication. 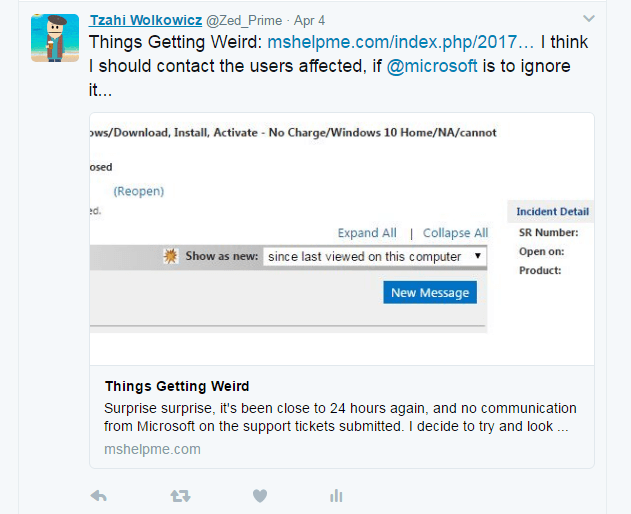 Tzahi decides to have another go at reaching out for Microsoft Support on Twitter. 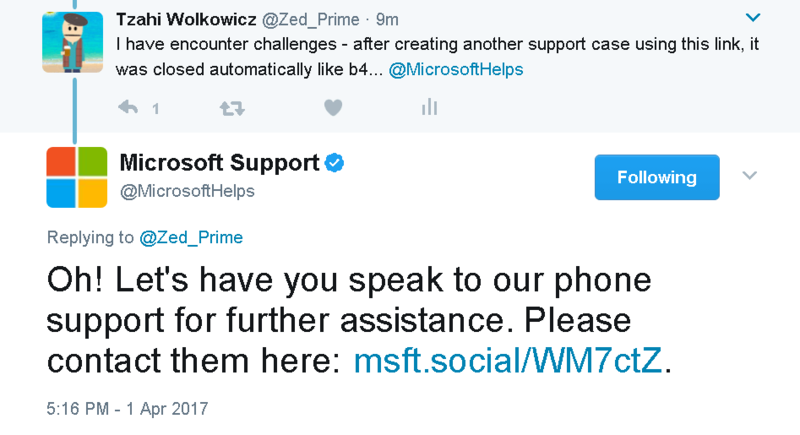 To his surprise, Microsoft Support replied within a few minutes and with a response that is not totally out of context! Could we be nearing the end of our journey? Keep reading to find out more! 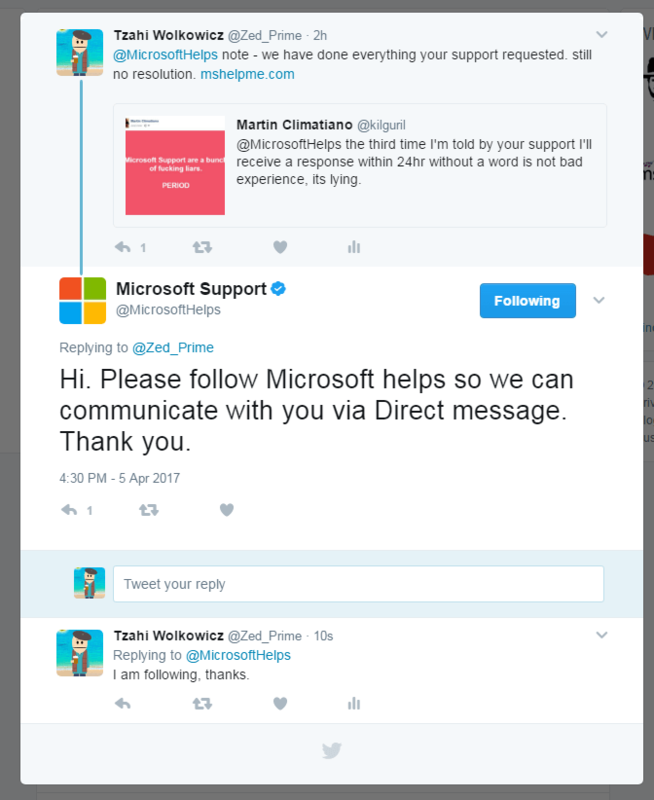 Microsoft support can’t seem to answer one out of five support tickets, but at their very least their Tweeter bot is doing a good job at following up on contacts. Being a nice person, Tzahi decided to let his voice be heard. Well, click baiting aside – the short answer is yes. 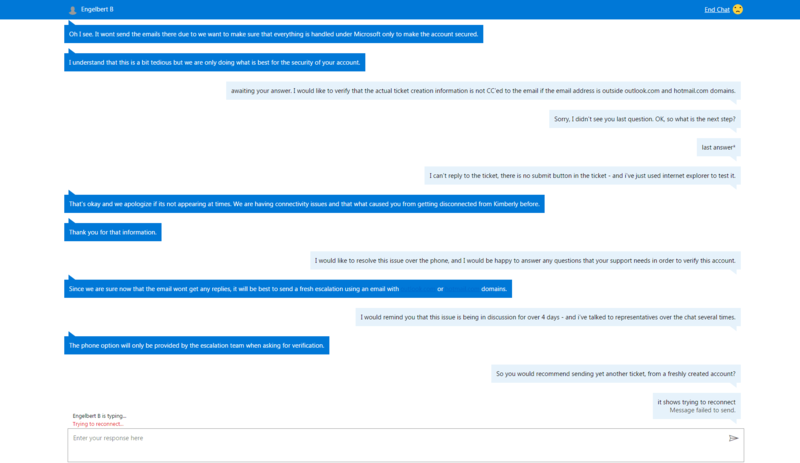 At this point I can say with full confidence Microsoft customer support representatives flat out lie to you. Got home from a short vacation and checked the status on the latest support ticket submitted to Microsoft – the one James ENSURED me will get a response. Want to guess what the response was? Nothing – and the ticket was closed. 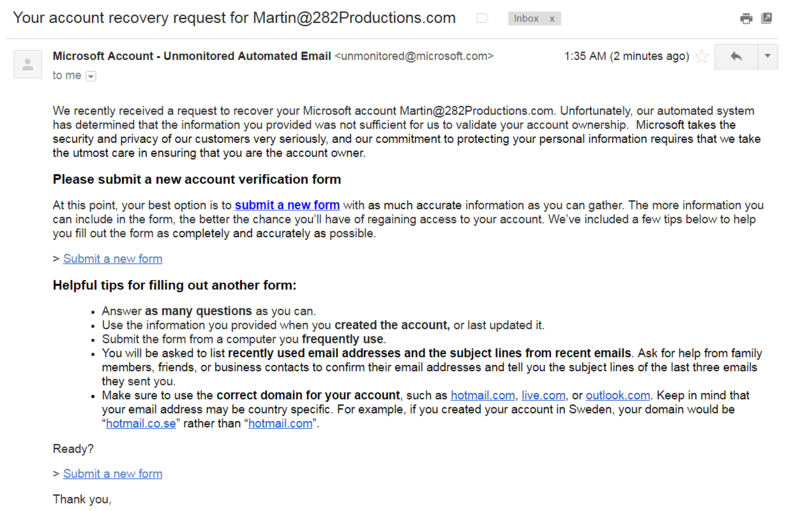 Martin: Ok, an attempt to call Microsoft support – take 2. MS Support: Welcome to Microsoft. If you have a special access code, press 9, or, wait on the line for additional options. If you are a home user, please press ‘1’. MS Support: Please choose your product. For all Windows versions, Explorer, Edge or viruses and malware, press ‘1’. For all Office Versions press ‘2’. For Microsoft hardware such as mouse and keyboard press ‘3’. Press ‘*’ to return to the menu. MS Support: Please choose one of the following options. If you are trying or can’t start your Microsoft program, please press ‘1’. If you need help with forgotten passwords for your Microsoft account or Windows Live Services such as outlook.com, one drive or skype, press ‘2’. For technical support, for all Microsoft products, press ‘3’. 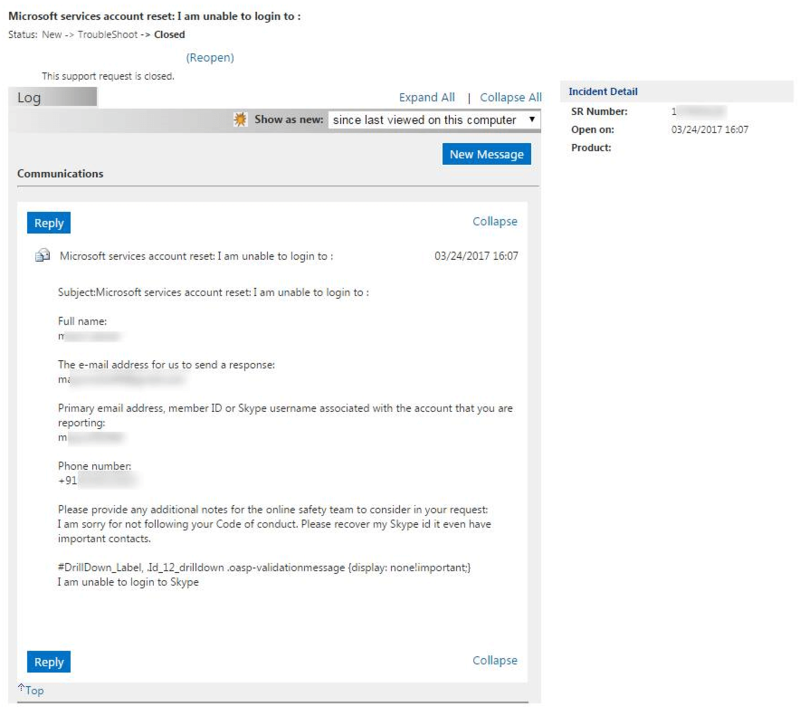 For support about subscriptions for Microsoft, payments or account management press ‘4’. 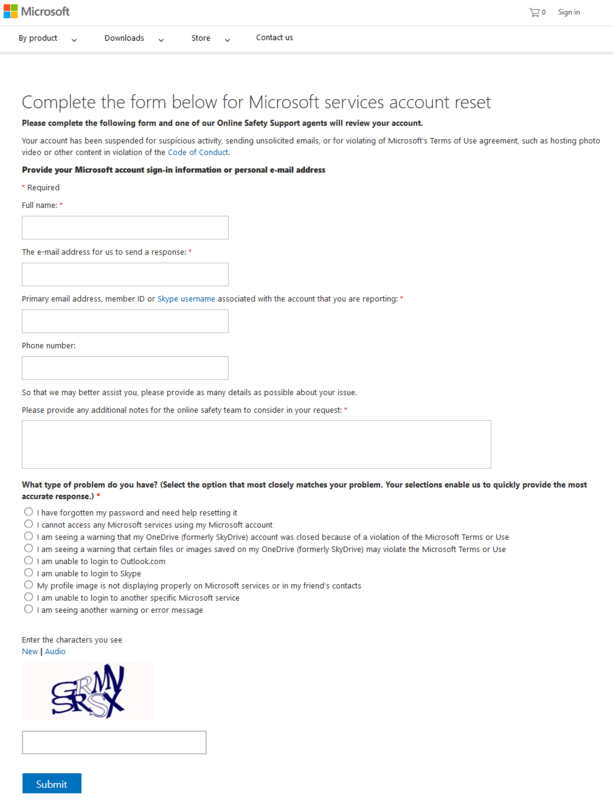 If you wish to purchase a Microsoft product, or for pre-purchase questions, press ‘5’. Press ‘*’ to return to the menu, press ‘0’ for the previous menu. MS Support: In case you had issues when trying to access your Microsoft account or forgotten your password press ‘1’. For support with Outlook.com, Skype or other windows live services press ‘2’. How did I not think of that before? I’ll just give Microsoft Support a call! MS Support: Welcome to Microsoft. If you have (unidentified) press 9 now or wait in line for additional options. 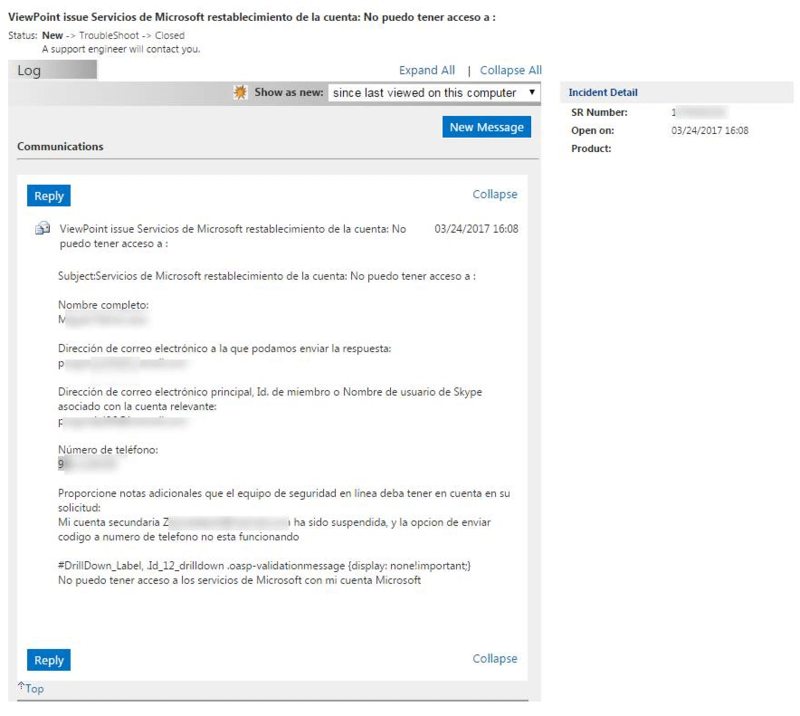 MS Support: If you are a home user, please press ‘1’, if you are a business costumer please press ‘2’, if you are a Microsoft partner, please press ‘3’. Please press ‘*’ to return to this menu. MS Support: Please choose one of the following options: If you are trying or can’t start your Microsoft application, press ‘1’. If you need help with forgotten passwords for your Microsoft account or Windows Live services such as outlook.com, one drive and Skype, press ‘2’. For support for all Microsoft products press ‘3’. For support for Microsoft subscriptions, Payments or account management press ‘4’. If you wish to purchase a Microsoft product, or for pre-purchase questions, press ‘5’. 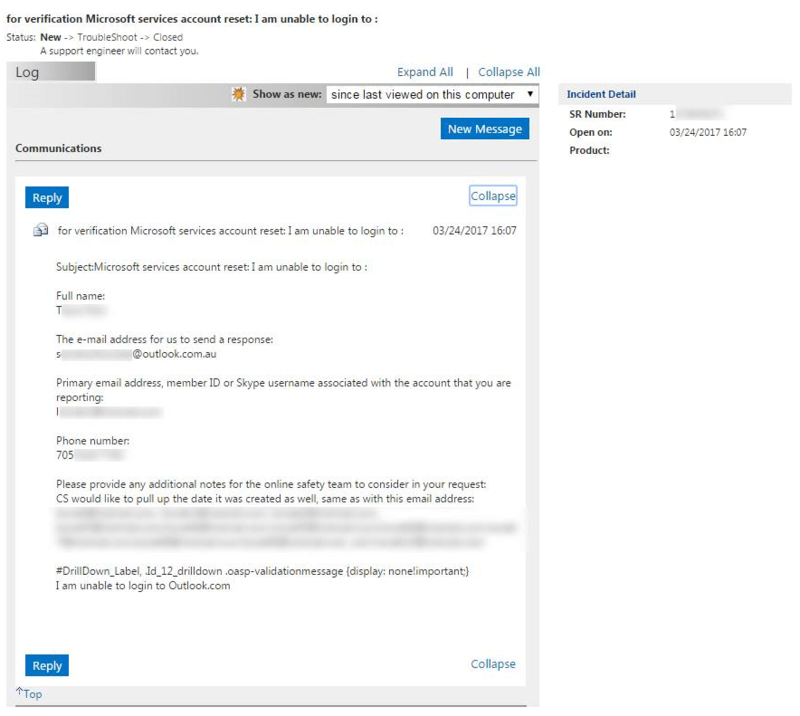 MS Support: Please choose one of the following options: for subscriptions or canceling an account press ‘1’, for subscriptions, applications or questions about payments press ‘2’. Press ‘*’ to return to the menu, press ‘0’ to return to previous menu. MS Support: Because your security is important to us, support for forgotten passwords or problems while trying to access your account are given using a secured web page. Please go to account.live.com/password/reset. I repeat – account.live.com/password/reset, thank you. Press ‘*’ to return to the menu. Martin: Well, this has been the world fastest support call (hangs). And in case anyone missed that, Tzahi was laughing in the background while hearing this. As if I did not see that one coming at this point. …and guess where the link from Microsoft Support’s tweet takes us? Looks like we’re back to square one again – time to submit another support ticket and another tweet on Twitter. It’s only day #2 into the tweet per day campaign and the unbelievable happens – we get a response from Microsoft. The first response is dull and simply links to the knowledge base article we’ve visited on day #1 – but Tzahi keeps insisting – he points out that in addition to the fact my account is STILL “temporarily suspended”, his account STILL has access to other people’s support tickets which include full names, emails and phone numbers. 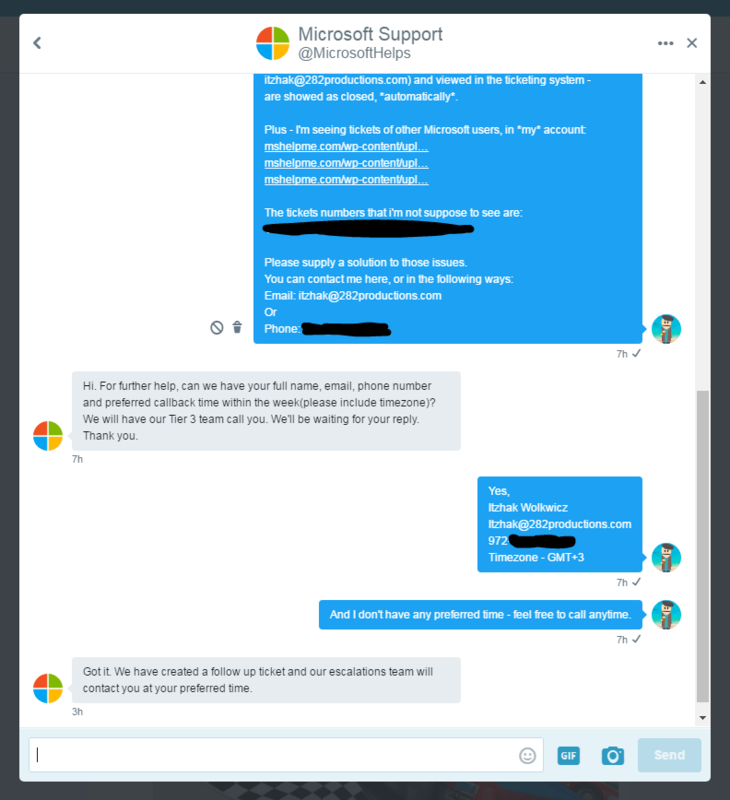 It seems that at least the people running Microsoft Support’s twitter page understand the severity of this issue and they instruct Tzahi to contact their “account specialists” as soon as possible! At this point Tzahi suggests a new MO – a daily tweet on Twitter until we finally get a response from Microsoft. 4 days, zero communication from Microsoft’s side – good thing we’re persistent. Seeing as both the Facebook and Twitter attempts were completely ignored, it’s time to try the online support representatives again! The first lesson we learned today is that if you want to use Microsoft’s online support chat you should be using Internet Explorer, Edge or Firefox. Tzahi likes using Vivaldi for some odd reason – and when you use Vivaldi and possibly other Chromium based browsers, the chat history just disappear at random. That is why the following conversations were only partly documented. Well, apparently Microsoft support is having some connectivity issues… but hey, at least we have another case number to add to the pile! Microsoft is not willing to communicate by email to emails outside of their own @outlook.com and @hotmail.com domains. Also, the only way to escalate an issue is by filing a support ticket – which as proven before – simply gets ignored. 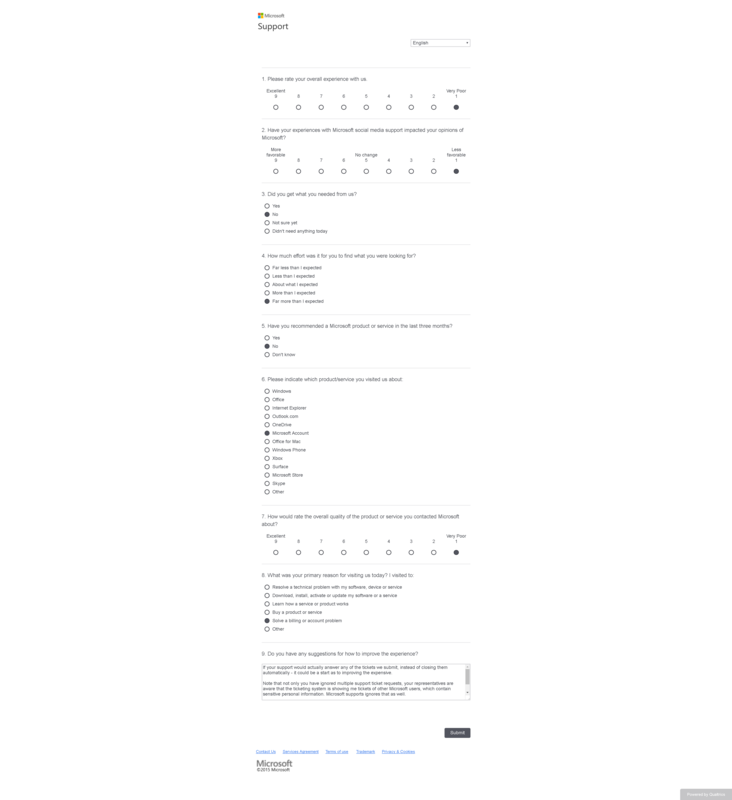 There is only one small problem… where is the submit button on this form? And just to clarify, this is how the ticket reply form looks on the latest version of Microsoft Edge. 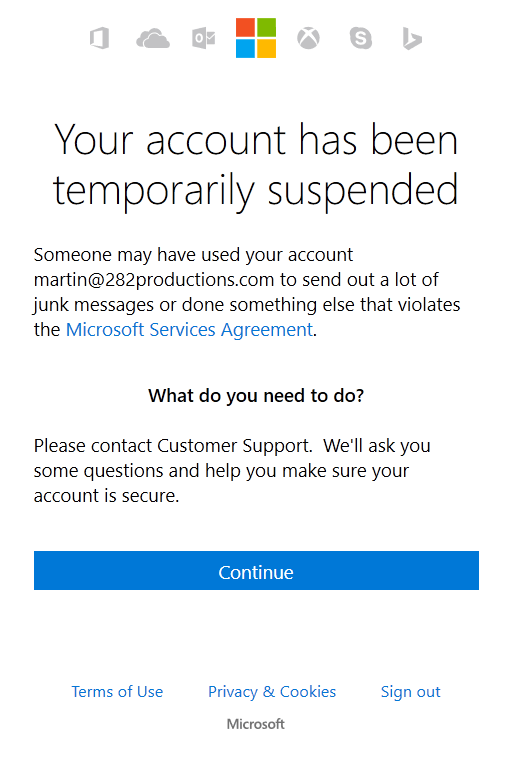 Maybe the fact my account has been “temporarily suspended” for several days does not warrant a quick intervention from Microsoft, but surely once they find out their users’ personal information is compromised they will pay attention and act to resolve the issue quickly. At least that was the general train of thought when Tzahi decided to try and reach out to Microsoft on Twitter after failing to get any notice through their support system and Facebook. Surprise surprise, it’s been close to 24 hours again, and no communication from Microsoft on the support tickets submitted. 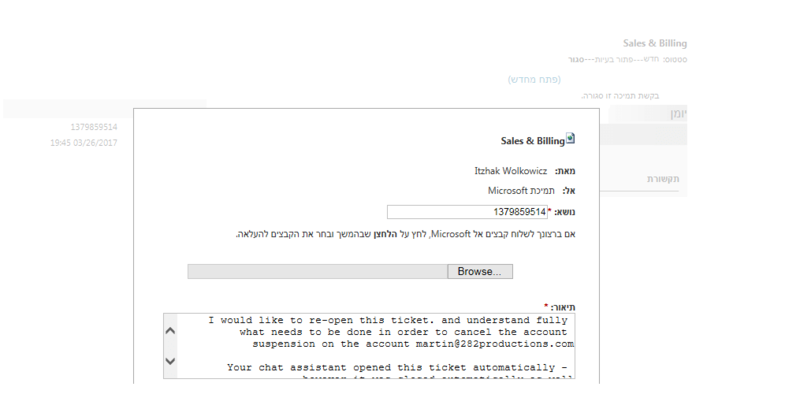 I decide to try and look the ticket status online, since this time everything was submitted through Tzahi’s account, and thankfully his account is not yet “temporarily suspended”. Out of all the support tickets submitted using Tzahi’s account (supposedly 3 in total), only one shows up in the ticket tracking system. But that’s not the most disturbing thing about this whole incident. So far it’s only REALLY REALLY BAD customer service experience. 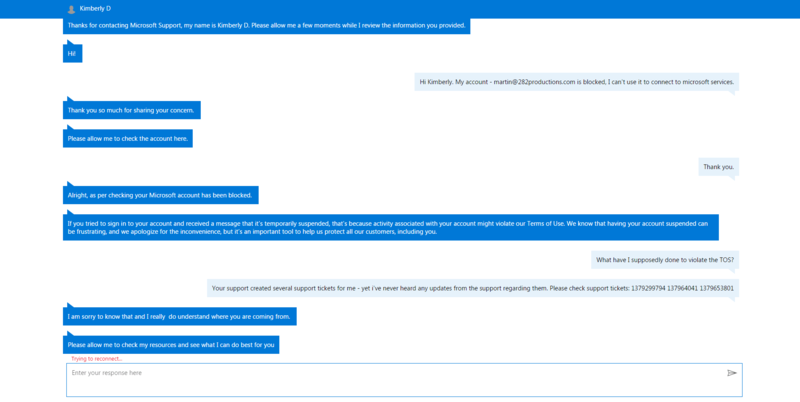 Quickly losing hope I will get any response to my support tickets submitted through the online forms, I decide to try and contact Microsoft support directly. Fun fact – you can only request a support call for US and Canadian numbers (country code +1). The only bit of information I was able to infer from that conversation is that my previous support tickets were indeed being ignored. Not clear on if I should submit a new ticket or not after this conversation, I decide to err on the side of safety and submit a new ticket just in case. So just to recap – at this point it’s been several days, 2 ignored support tickets and supposedly 2 new support tickets. One of them is SURE to get a response at some point… right? It’s been almost 24 hours since the second support ticket was submitted – this time following all the instructions to the letter – and still no word from Microsoft customer support. No communication what so ever – and at this point Microsoft has multiple email addresses and phone numbers they can use to reach me to resolve this issue. I am pretty pissed off by now so I decide to go on Facebook and try and get Microsoft’s attention while venting off some steam. At this point I blame myself for not following the Microsoft’s instructions to the letter. Sure enough, 24 hours come and go and not a single word from Microsoft support regarding my account. At this point I also realize my home PC is a ticking time bomb which can lock me out of all of my work software in an instant. Only problem with that is that since my account is “temporarily suspended” I can’t access the support ticketing system. Thankfully, Notepad++ is not tied to an online account system, so I can still get through the meeting with only slight inconvenience. At this point I do realize I need to do something to “fix the problems with my account”. Being a nice user, I do as I’m told and log in to https://account.live.com with my account. I am greeted by the “Account Temporarily Suspended” message posted below. Not going to repost it, only what follows after you click continue in that window. First thing that happens is that you are redirected to a support entry on temporarily suspended accounts. According to the instructions you need to create a temporary account to file a support ticket and customer support will get back to you within 24 hours. Well, there’s obviously something wrong with the temporary account system, but maybe if I click the “Contact Support” link it will take me to the proper place I need to go to setup a support account so I can have my issue resolved. …or not. You can happily submit your ticket with your suspended account even though it clearly states in the instructions you should use a different account. Well, since the temporary account system doesn’t seem to work, I decide to file the ticket using my suspended account any way. I get a nice confirmation number for my ticket – sadly this screen is not documented since at this point I was still naive enough to believe the issue will be resolved with that single support ticket. If anyone cares, the ticket number is 1379299794. 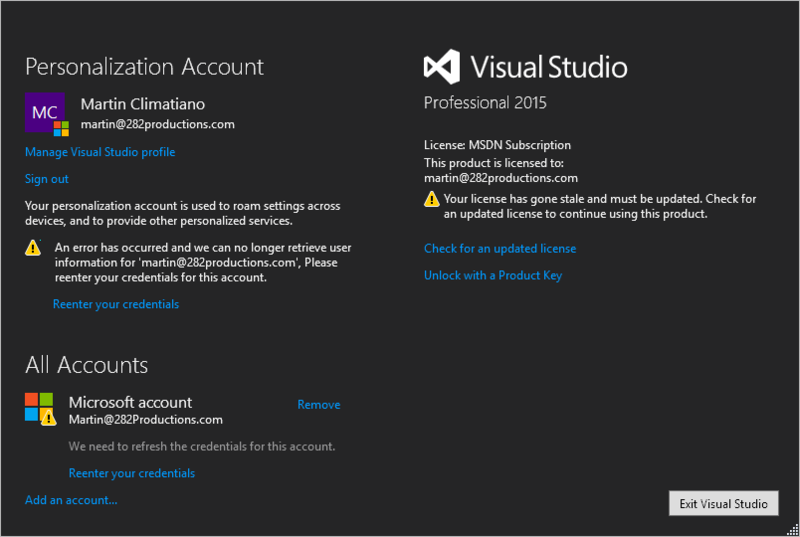 The Visual Studio license has gone stale. That much makes sense, the laptop is mostly plugged to the TV in the living room and serves as a media hub. I only use it for work when I’m traveling so it makes sense Visual Studio was not launched on it for several weeks. …or not. That’s the page I am greeted with after I log in to my account through Visual Studio. Needless to say, once I dismiss this window Visual Studio shuts itself down. 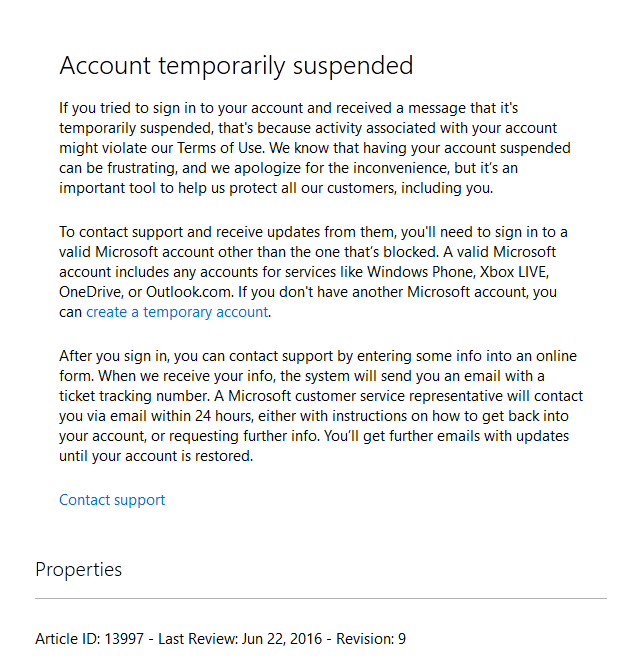 I am not yet aware my account has been suspended by Microsoft. The first hint appear in the form of a toast notification popping up every time I log in to Windows on my desktop. At this point I happily ignore the message and keep going on my daily business. Powered by WordPress | New Technology theme based on: Retro MacOS by Stuart Brown.